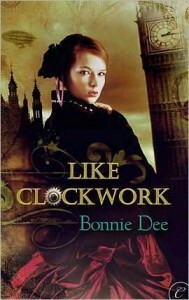 LIKE CLOCKWORK tells the story of Victoria, an upper-class scientist who helped invent the technology being used to build automatons (android like people), and Dash, a leader of the underground Brotherhood group made up of the working class poor who have all lost their jobs and livelihood after being replaced by automatons. Victoria and Dash appear to be on opposite sides of the social issue involving the new clockwork industry of automatons, but when Victoria discovers her mentor dead and corruption among The Commission for Animatronic Affairs, she turns to Dash to help stop the corruption and find the identify of a serial killer. This is the hardest kind of book to review, as it was neither good nor bad. But overall, I found it a short and rather forgettable steampunk themed romance. Set in Victoria London, it gives readers the expected steampunk elements such as mechanical humans and air travel, yet it didn’t resonate as much more than a typical historical romance. The story moved at lightning speed, which at first made it difficult to believe the attraction between these two. But as these two faced danger toward the end, it did make me a believer that these two very opposite people could come to love one another in such a short time.